You are here: Home » Philosophy » Advising » Why Study Philosophy? It is a common stereotype that philosophy is not practical, or that it doesn't prepare you for life. This is the premise of many jokes, some of which are even funny. But there are very good reasons to think that this stereotype is inaccurate. Consider the fact that, on average, philosophy majors go on to have higher incomes than nearly all other humanities majors, and that they go on to have higher mid-career incomes than people who majored in many other disciplines that might surprise you, including biology, nursing, business, communications, health sciences, public relations, journalism, fashion design, human resources, graphic design, and kinestheology. If you find this surprising, check the data for yourself on payscale.com. 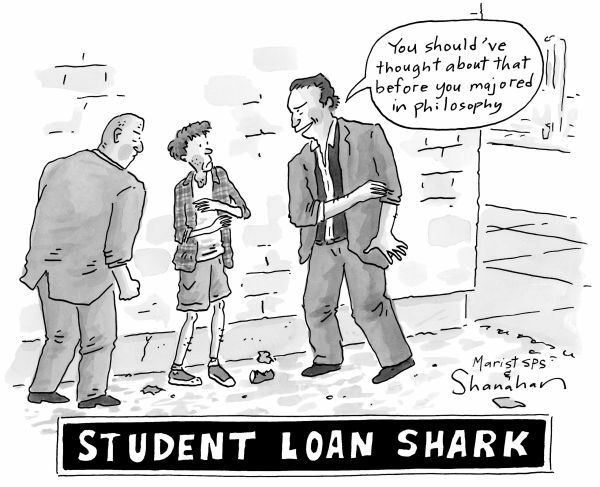 How do philosophy majors wind up making all that money? There's no single answer to this question, because philosophy majors go on to many different careers. Like almost everything else you can study in college, philosophy courses are designed to give you skills that can be used across many fields, rather than to prepare you for any single career. Still, it is possible to find some information about the career paths that philosophy majors have actually taken in the past. Check out this post on the philosophy blog, The Daily Nous, which shows how you can explore data about the careers of the almost 400,000 LinkedIn members who majored in philosophy. (You may also want to look at the data on other majors. You'll find that there's no simple answer to the question of what they wind up doing either.) While you're at it, check out this graphic of some of the famous and successful people who majored in philosophy. The fact that philosophy majors go on to earn comparatively high salaries is at least partly explained by the fact that majoring in philosophy helps people get into graduate schools of various kinds. As this census data shows, Americans with advanced degrees earn 29% more per year, on average, than those with just bachelor's degrees. And philosophy majors do extremely well on graduate-school entrance exams. As this post on the American Physical Society's blog points out, for example, philosophy majors score higher on the verbal and analytical sections of the GRE than any other major, and they score higher on the quantitative section than any other humanities major. As this data on the American Philosophical Association's website shows, philosophy majors are among the top performers on the LSAT, and are admitted to law school at a higher rate than other humanities majors. According to data summarized in this post on the Prep4GMAT blog, philosophy majors also score higher on the GMAT than any other humanities major, and higher than business majors of any kind. Although MCAT scores aren't tracked by major, data recorded by the Association of American Medical Colleges shows that humanities majors do quite well on the MCAT, and so, given what we know about how philosophy majors perform on other standardized tests compared to other humanities majors, it would not be surprising if they do quite well on the MCAT as well. What is the fundamental nature of reality? What is it to be human? What is knowledge, and what can be known? How should we live? What is a just society? What are the nature of race and gender? What is it to have a thought, or to communicate with language? How do the natural and social sciences explain the world, and how do their explanations fit together? How can we change the world for the better? These are are among the most fundamental questions that we ask. They demand philosophical attention because making progress on them requires equal measures of creative imagination and logical rigor, and those are philosophy's specialties. Aside from solid reading, writing, and communicating skills, learning philosophy develops one's capacities for both open-mindedness and rationality, and brings these skills to bear on deep and difficult problems of both practical and theoretical kinds. The usefulness of these skills extends far beyond philosophy. Indeed, the success of philosophy majors is partly explained by the versatility of the skills that doing philosophy promotes. Because of the flexible habits of mind that it inculcates, and because of its many interdisciplinary connections, philosophy also pairs well with other majors and minors. Ethics, social philosophy, and political philosophy compliment law and political science. Aesthetics goes well with the visual and performance arts and with literature. The history of philosophy pairs well with history and classics. The philosophies of language and mind pair well with psychology, linguistics, and cognitive science. Logic intersects with both mathematics and computer science. More generally: the reading, writing, and critical-thinking skills fostered by philosophy are useful for nearly any college-level course. So far, we've made the case that studying philosophy is a good means to several commonly valued ends, such as succeeding in one's career, on entrance exams, in other college subjects, or in becoming a more creative and critical thinker. These are all goals that studying philosophy can help you to accomplish; they are among the things that make philosophy extrinsically or instrumentally valuable. The experience of doing philosophy can be deeply fulfilling—an activity that is valuable in ways that can't be measured by your future earnings or test scores. Like high-level athletic performance, this is an experience of using your uniquely human capacities to their fullest extent. Studying philosophy is a way of developing these capacities that has been practiced for thousands of years. College is likely to be among the few times in your life when you are free to pursue intellectual and personal growth in a way that isn't dictated by parents, a boss, or a paycheck. Using that freedom wisely means, at least in part, studying something that you are passionate about. So although you should of course be preparing for what happens after college—and don't forget: studying philosophy is a good way to do that—you should also be sure not to waste your experience in college on something that you don't find intrinsically valuable. This advice is something that most philosophy majors have figured out.